Tie dye knit hats for kids can be found online or in some children's specialty shops. However, you also have another option. You can easily make your own tie dye hats. 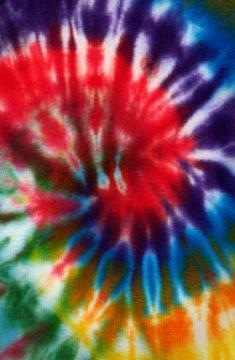 The art of tie dye is typically associated with the hippie era of the late 60's and early 70's. Popular musicians of this time period, such as Janis Joplin, often wore tie dye clothing and accessories during their performances. The fad soon became a "must-have" fashion item for many young people. However, the history of tie dye can be traced back to A.D.500 to 800 in Peru, as well as tied to the ancient Japanese practice of Shibori during the eighth century. In addition, tie dye techniques continue to be used around the world, from West Africa to Indonesian and beyond. Anyone can tie dye. All that is needed is a piece of material and several different dye colors. The pattern is created based on how the material that is to be dyed is folded or twisted. This folding and twisting creates the pattern, because the dye doesn't penetrate every area of the cloth. In some sections, the color is deeper than in others. Other sections may not receive any dye at all, and this is how a distinction in pattern is formed. In the past, common dyes were often used to create the tie dye effect on shirts, jackets, pants, hats, scarves, gloves, etc. Today, experienced tie dyers often turn to fiber reactive dyes, which create a more permanent color binding, particularly when used in warm room temperatures. Many people often add soda ash to the dye/water solution to raise the PH and help hold the color. Common material used for tie dying includes cotton, rayon, linen, hemp and knit. Most kids love to wear anything in a tie dye pattern, and this includes hats. While you can purchase tie dye knit hats for kids, why not spend an afternoon making a tie dye hat with your child? Knit hat - Look for a hat in a solid color. You can choose white or a pastel color. You'll probably want to avoid darker colors, however, which can be difficult to cover and can affect the desired hue of the material. Dye - Look for dye at your local fabric or craft store for best results, since these dyes are usually better designed for tie dyeing projects. Common dyes found in grocery or department stores are usually best suited for dyeing a fabric one specific color. Rubber bands - You can also use string, but rubber bands are usually easier to work with. The larger the bands, the larger the white or neutral space you'll create on the hat. Squirt bottles - If you want to create a specific design, use a squirt bottle to add dye to exact areas. Rubber gloves - The thicker the better when it comes to purchasing rubber gloves. The dye may not irritate your skin, but it can be difficult to remove. Large container - A three to five gallon bucket works best, and you'll probably want to do your tie dying outdoors. If you do it inside, cover your floor with a protective, waterproof tarp. You'll also need a bucket for each color. Before you begin, read the directions on the dye package. You may be required to pre-treat the hat with water and soda ash or salt. Add rubber bands to your hat. You can do this randomly, or you can create a more uniform pattern by tying up even sections of the hat, such as on the front, sides, and back. Be sure your bands are wrapped tightly to prevent colors from bleeding into one another. Dip different sections of the hat into the various buckets to add a variety of colors. Another option would be to buy a hat in the base color of your choosing, like pink or light blue, then choose one other color to create a tie dye contrast. For more precise coloring, use a squirt bottle to apply color. You'll need to follow the directions on the dye package as to how long you need to let the dye sit before rinsing it. Wash the hat several times by itself and until the color doesn't bleed. If you would rather purchase tie dye knit hats for kids, check out the following websites.